MSC are pleased to team up with Haka Tours, to deliver skills clinics for their international clients. MTB Skills Clinics are pleased to be working with Haka Tours, who run guided adventure and snow tours of NZ for international customers. Haka have expanded their tours to include a range of guided Mountain Bike options, sampling some of the best MTB that New Zealand has to offer and including many awesome stops and add-ons along the way. Small group guided MTB tours for international customers had been on their radar for the last few years and Haka are excited to be launching their MTB tours this summer! Haka Tours have included MTB Skills Clinics in their tours and have a MTB Skills Clinic option for their customers on the Rotorua stop in the Redwoods, in Wellington, and in Nelson. The first Haka Tour MTB customers are taking a clinic in Rotorua on December 6th with Sean McCarroll. MSC has partnered up with Rabbit Ridge in Queenstown, to deliver skills clinics in the Southern Lakes. We're pretty happy to be able to offer Queenstown skills clinics through a partnership with Rabbit Ridge, in the Gibbston Valley just out of Queenstown. MSC's Dave Harding-Shaw (ex Wellington) shifted to Queenstown last year and has had a bit of a break from coaching while he settled into his new home, and is ready and keen to get some clinics rolling. Check out the Queenstown heading on our Bookings page for scheduled clinics, and http://www.rabbitridge.co.nz/ for more info on Rabbit Ridge. Trail Fund NZ is thrilled to have MTB Skills Clinics – New Zealand’s most comprehensive off-road skills programme – join the ‘1% for Trails’ programme. 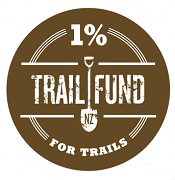 As a 1% sponsor, MTB Skills Clinics will donate 1% of all revenue from sales to Trail Fund NZ, who use the funds to support the development and maintenance of publicly accessible, environmentally sensitive and sustainable mountain bike trails around New Zealand. “We’re proud to become an official Trail Fund NZ sponsor,” says MTB Skills Clinics’ Chris Mildon, whose been riding all manner of bikes from a very young age. He’s been a sustainable trails supporter and advocate for years, and feels this sponsorship is a natural fit for the company. Giving back to the mountain bike community is important to MTB Skills Clinics’ coaches across the country. “We’ve had coaches running skills clinics in most main centres around New Zealand since 2004, and all of them are strongly linked in with their own local and regional communities,” says Chris. “They contribute to mountain biking in many ways, including trail development. “Having access to good quality and sustainable trails is essential to our mission, which is to help mountain bikers across the country experience the joys of off-road riding. We’ve had more than 4,000 riders attend our courses, and freely accessible riding resources are an important part of the picture for these riders and the fast-growing mountain bike community. It’s through the generous support of sponsors like MTB Skills Clinics that Trail Fund NZ has provided grants for 47 volunteer-led trail projects across New Zealand since it was founded in 2012. “We’re very pleased to have MTB Skills Clinics join the ‘1% for Trails’ programme, and are grateful for their continued support of trails around New Zealand,” said Trail Fund NZ chairperson Ben Wilde. MSC will be delivering skills clinics at the Four Forty MTB Park this summer. This is great news for especially all those Auckland riders who will be travelling the hour south east to get a worthy, shuttled, gravity riding fix at the park. Dates, times and clinics on offer for Four Forty are now listed under the 440 MTB Park heading on our Bookings page! The new Gravitymaster clinic will be delivered at 440, and please be aware that when booking this clinic, you'll need to also purchase a six run shuttle pass. We take care of that for you as part of the booking fee so there's no delays at the park, and we'll have you on the first shuttle at 9.30am. While you may not use all six shuttle runs during the clinic, there is still plenty of afternoon left after the clinic finishes at 1.30pm to put our Gravitymaster coaching into practice. Follow all the 440 MTB Park action including detailed park info here.